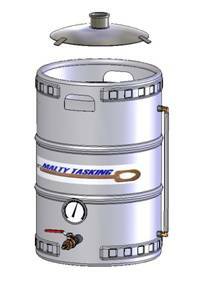 Malty Tasking encourages you to obtain a keg legally! Stainless Steel Beer Keg 15.5 gallon: Key word search: “Beer Keg 15.5 gallon” on http://www.ebay.com/ $10-$45 plus shipping/handling. Dial Thermometer: Key word search: “Kettle Thermometer” on http://www.ebay.com/ $18-$21 plus shipping/handling.